Sonam Rawat from Delhi, B.A Graduate. Working for : Triveni Udyog Pvt. Ltd. Currently working as Office Assistant at Triveni Udyog Pvt. Ltd.
are one of expert skill area's of Sonam Rawat . 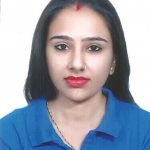 Sonam Rawat is working in Call Center BPO industry.